Note: This is a summary of The 48 Laws of Power, not the original book. This summary is not endorsed by or affiliated with Robert Greene. The 48 Laws of Power by Robert Greene is the ultimate guide to putting yourself in a place of power. It is about knowing your weakness, playing on your strengths, and manipulating your enemies. It is the guide to get if you are wanting to raise your ranks in your office or business. There are no other books with the source of power. 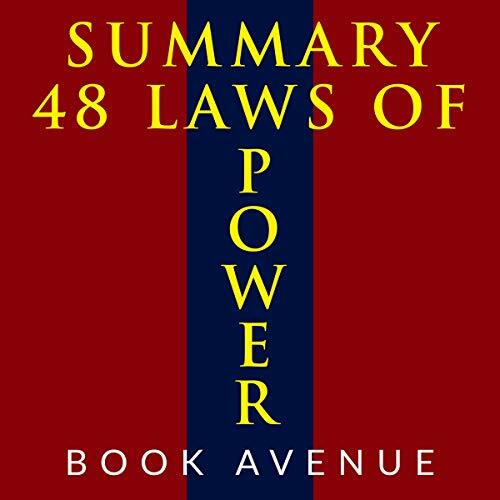 This is an overview of the actual book “The 48 Laws of Power.“ Kind of like an abbreviated for the full book. It provides a potential reader enough information regarding this book’s content to determine if we want to invest the extra money and time to actually buy and read the entire book. The 48 Laws of Power is a self-help book that offers advice on how to gain and maintain power. The book sounds more like a how-to book for a confidence artist than a book that anyone with a sense of integrity and morals should want to follow. It was great to be able to go over the important prices and to be able to do it quickly.I highly recommend this thorough and well-written summary. The 48 laws of power is a practical guide for increasing your cunning in social situations. Some of the laws in this book I have found are extremely helpful rules to remind myself of every day. This book is the perfect secret weapon for mastering social dynamics. Humans are creatures of habit, understanding and dissecting humans psychological nature is an intelligent way of journeying life's unavoidable encounters with one another. While the underlying theme may be deception and its many forms, there’s lot to be learned. From the paradigm of the just it will serve as a tool for uncovering peoples hidden motives. Whether you have evil intentions or not, this book is an essential listen for everyone wanting to enter an occupation dealing with people to further your cause and defend yourself from other people. Key to power and success. This was one of the best books I've listen in a long time. I can see how these laws can make or break a person. Plan all the way to the end. It's key to achieving your goal, and it's laid out to perfection in this work. A definite must listen. Recommended. Some of the "Laws" are more helpful than others, but it is definitely worth spending some time reviewing power relationships and makes you think.